For the most part, ‘General Hospital’ showed off what makes soaps a great genre this week. Action, emotion, snappy dialogue? It was all on firm display. I know a lot of fans don’t like baby switches, but GH handled this Tea and Sam baby switch with aplomb. I also know it was supposed to last longer – but Steve Burton’s departure forced a resolution before the writers were ready. Still, the story line didn’t feel forced and things seemed to come to a natural head this week. Not only do we have the tragedy of Tea finding out that the baby isn’t really hers looming – but we also have whatever antics Todd is going to go through to squirm out of this. The good news is, he can rat on Johnny now. I have never been a fan of babies on soaps – so I’m one of the few people that isn’t looking forward to Sam getting her baby back. Sam has never been as entertaining to me as she has these last few weeks flirting with McBain and (more importantly) standing on her own two feet and not propping Jason. At least I know Jason is going to “die” in the next few weeks – so I won’t be saddled with a happy mob family for very long. I will say this for Burton, though, his Jason showed more range this week than the character has in years. He’s still a mobster, though, and I’ve seriously had it with mobsters on GH. Which, of course, brings me to mobster number two. And, no, I’m not talking about Sonny. For once, it was a relief to have Sonny relegated to the background for the bulk of the week. I’m sick to death of him and his multiple personality girlfriend, quite frankly. No, the mobster in question is Duke Lavery. Now, I’m going to be honest, I was quite young when Duke was on. I don’t remember a great deal about his storyline. I don’t remember hating him, that’s for sure. I don’t remember loving him either. So far, I’m not exactly happy with his return. I don’t remember Duke being this arrogant. He was never a shrinking violet, but I don’t remember him being this aggressive. Like I said, though, I was a child. Maybe I’m just romanticizing the character. Quite frankly, I can’t see why Anna would ever love this man. Now, I should point out, I am (and will always be) a diehard Robert and Anna fan. I don’t want her to end up with anyone but Robert, but this isn’t the Duke Lavery I remember. And I don’t want her wasting time with him if he’s going to stay this way. I’ve seen some conjecture that Duke is actually someone else – maybe Faison – but I have a problem with that, too. Duke hasn’t been reminiscing about Anna like he’s someone else. He’s been recalling specific Anna and Duke times together. Also, when he was sitting next to Robin’s bed, he was talking to her with a certain amount of love. Now, Faison was delusional and obsessed with Anna, I’m not going to deny that. He had no real love of Robin as a person, though. I mean, he had love of her as an ideal – an ideal that she would somehow help him get Anna – but there was no real love there for Robin. Duke had real love for Robin. However, the Duke I remembered would not keep Robin from her mother, either. I guess I’m not sure what to think of Duke. I’ll give him more time before I rush to judgment. Finally, that brings us to the mental patient: Heather Webber. Robin Mattson is a comic genius. Not only does she imbue wacky Heather with a certain level of likeability – despite the horrific things she’s doing – but she also makes you want to laugh. I don’t know any other actress that could hold a baby on the roof of the hospital, threatening to jump and kill him, and still have me rooting for her in a certain respect. Don’t get me wrong, I don’t want Heather to kill the baby. I don’t want to have to see it, but I don’t want her to kill it. Still, part of me is sad she is (reportedly) plummeting to her death. Why can’t the writers just put her in a coma and dust her off at a later date? I agree Heather has run her course for now, but there’s always room for more Heather down the road. What do you think? 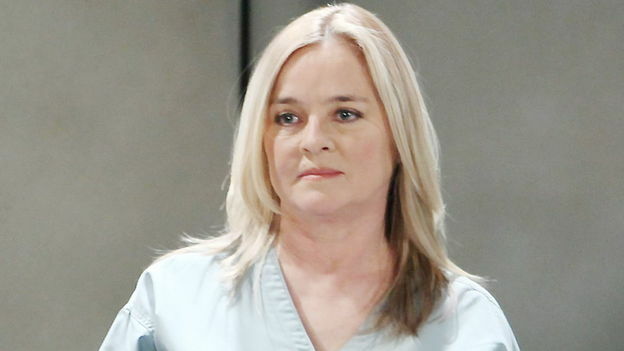 Were you satisfied with this week’s ‘General Hospital’ or were you disappointed?